Escape the city as fast as you can, turn off the freeway and head down the scenic Tourist Drive 33 from Calga/Peats Ridge all the way down to Laguna and into historical Wollombi Village. 3. Hike: Enjoy an early morning hike around Finchley Trig and experience its 360-degrees views over the Yengo National Park and looking out to the Great Blue Mountains World Heritage. Accessible by 2WD from Laguna via Yango Creek Road and then Upper Yango Creek. Approx 10km of dirt road. Enjoy its solitude. 6. Get Cultural: The 1866 building was once a Court House, Police Station, Community Hall and now a Museum. Pop in to check out the old black and white images of Wollombi Village. They are amazing of a world-gone-by. If only these walls could talk! 7. Afternoon delight : Pop into Laguna Village Providore and pick up some local Hunter Valley Cheese, crackers, Turkish delight and nuts and head back to Little Valley Farm to enjoy the outdoor bath overlooking the alpacas with your boutique wine. Chillax at its best and your digital detox starts now. Next day.. what to do? We say… book in Melissa! 9. Sleep: You will be blissfully relaxed so go on, you deserve it, sleep-in and then you can play with the alpacas later. Its the most wonderful time to visit the Hunter Valley and especially us at Little Valley Farm. The baby alpacas (cria’s) are due at the end of Autumn. The leaves will start to turn a beautiful red colour and if we are lucky to receive rain, (please give us rain), the paddocks will then be green and super lush. So come on rain and come along guests for this Autumn experience. Book via AirBnB here for your unique ‘glamping’ vintage train and shepherds hut experience. Glamping at its best with Little Valley farm. Enjoy the outdoor bath, bonfire, wood-fired pizza oven and the unique bonding with our precious alpacas. The spotlight shines on autumn, a season renowned for its cooler temperatures and fall foliage. Autumn leaf color is a phenomenon that affects the normal green leaves of many deciduous trees and shrubs by which they take on, during a few weeks in the autumn season, various shades of red, orange and brown. A perfect setting for photographers. 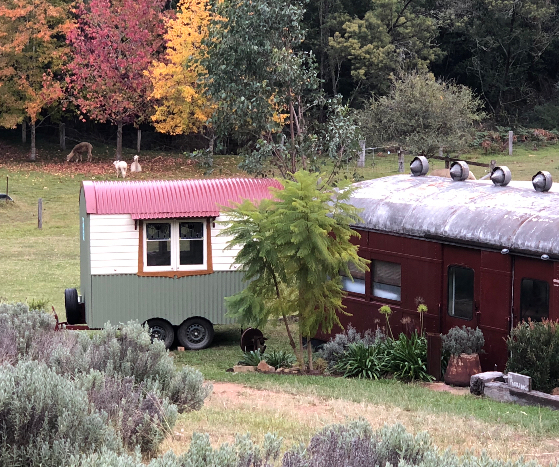 Visit Little Valley Farm and stay in our red rattler 1950's train and shepherds hut for your unique farm stay in the Hunter Valley. 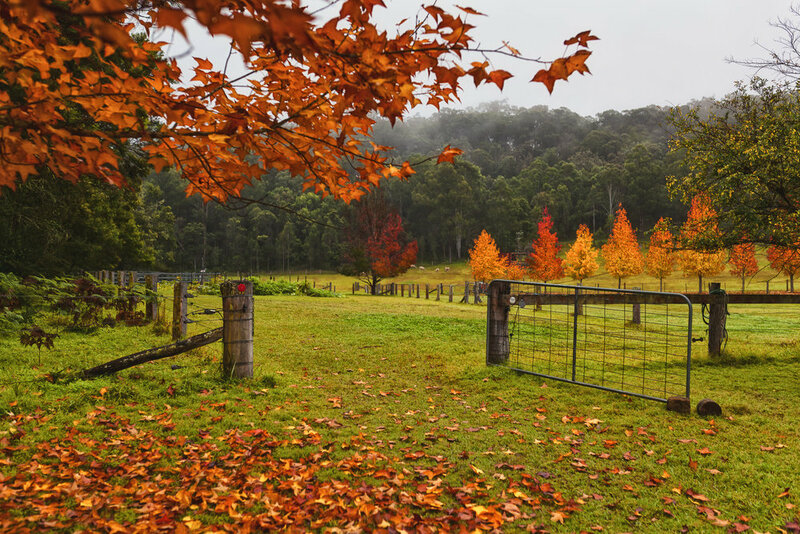 Tree change occurs Autumn so make the most of this beautiful farm in the Hunter Valley. 1. Neve the friendly Laguna Alpaca. Neve loves guests, the camera and alpaca pellets. Take the time to sit in the paddock with all our girls and boys. 2. The famous 1950’s Red Rattler train with an outdoor bath and hammocks overlooking the Alpaca paddocks. Need I say more? 3. Get totally off-grid and enjoy the digital-detox with no mobile reception on the farm. Ahhh Peaceful at last! 4. Book in the wood-fired pizza oven and enjoy making your own delicious pizza. Just add wine! 5. Sample Wollombi Valley’s Boutique wineries such as Stonehurst Winery or head towards Broke to Krinklewood Vineyard. 6. Enjoy an amazing Friday night dinner at GNTP and hang out with the locals in this iconic Laguna destination. 7. Sleep in and wake up to the sounds of Farm life - guinea fowl, chickens, lyrebird’s and kookaburra‘s. 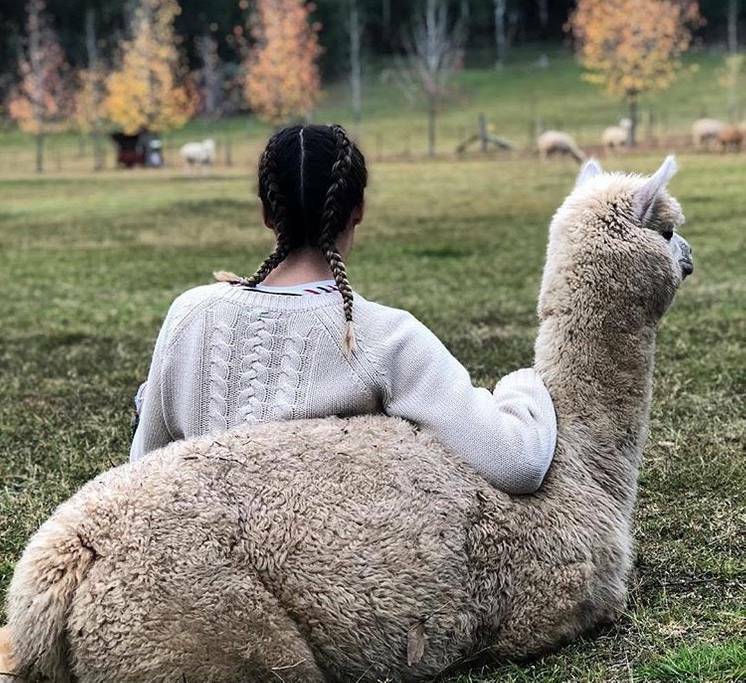 Find out more on our unique alpaca farmstay at Little Valley Farm. Book your alpaca farm stay today click here. Yesterday we had the most magical photo shoot at Little Valley Farm. Neve, the friendly Laguna Alpaca did not disappoint. Soon as she met the kids, she gently ate from their hands and then plonked herself right in between the kids and posed for the camera. Neve, the friendly Laguna alpaca is amazing with her desire to be with people. She picks her people and will happily sit with them for hours in the paddock. The look of disappointment when we get up to leave is hysterical and yesterday she just wanted to sit with the kids under the huge liquid amber tree and just smile away. There are times and its always on her terms, that when she is done, she simply gets up and walks away but she really loves hanging out with people. Before we introduce Neve and the other alpacas whom are mostly pregnant and a couple of cheeky weathers. Our working stud is in another paddock watching over us. Our advise to people when meeting our alpacas for the first time is to walk slowly to the alpacas, no loud talking and try and whisper, don't try and pat them on their head but when they are ready gently stroke their necks. Moving slowly and quietly the alpacas feel calm and relaxed and will come up to you. One thing for sure is that we keep the working stud (entire male) away from the alpaca herd and especially when we have guests over. Alpacas are inquisitive and gentle creatures but will occasional spit when food is present. They really don’t have the the desire to spit at you but you could always be standing in the line of fire! Maybe our Little Valley Farm alpacas are just well behaved, beautifully treated and know that they are very much loved. Little Valley Farm is a member of the Australian Alpaca Association and sells registers and unregistered alpacas. We sell wethers as guards, alpacas as pets and or breeding females. Our alpacas are shorn every October and are regularly groomed - nails trimmed, teeth check, fleece check, vaccinated and wormed. If you are a small farm owner and are looking for alpacas, simply let us know what you are looking for and how your farm is set up ie., shelters, fencing, water and small pens so we can give you the best advise for housing alpacas. Spring is the best time to visit the Hunter Valley. The valley is alive with colour and finally our paddocks are lush green after thankfully, receiving a lot of rain in October. It was amazing! Our alpacas are happily frolicking across the fresh grass and feeling cool after their big shearing day. Don’t forget we have our unique farmstay in our rustic train carriage by the alpaca paddocks. So you can book on airbnb. At Little Valley farm we are getting ready for Alpaca shearing day so looking at what colours we should spin together. Should I keep our yarn knitting balls one colour or add colours to our fawn yarn ball. Here is a sample we spun which is 100% Alpaca fleece in fawn with black. Do you like? Hmmm should I do both or stick to one colour? Shearing day is 13th October, 2018 at Little Valley Farm, we will be shearing 14 alpaca's in white, fawn and one chocolate brown alpaca. We can't wait. If you would like to help out and get some hands-on alpaca experience please contact us. We also have the train and shepherd's hut accommodation available for that week. Say hello to Majestic and Suki Oberon. They are the sweetest alpacas you will meet and they will come up to you to eat out of your hand. Their fleece is outstanding with lovely crimp and we look forward to shearing them in October and then spinning their fleece. Its glorious! Both girls are pregnant and due early 2019 so we will have three different blood lines at Little Valley Farm. Book your farm stay with us at Little Valley Farm. Couple farm stay for 4 adults so book online before Spring 2018 books out. Alpaca cuddles are free. Photo taken by Daniela 31st July 2018. You can see how dry the grass is here. We are so looking forward to some rain. We have only received 2 mls for July. Its just on six months since we did the ABC Newcastle drought interview. It was a stinking-hot summer and I looked like I had enough. I had never felt so un-glamourous in my life! But now looking back to February 2018 after my interview, we luckily did receive some rain but definitely not enough and definitely not constant rain. We are lucky, as we are a small farm but we all have livestock and produce to grow so it all affects us - whether you live on a farm or in the city, the produce quality will decline and our grocery costs will slowly increase, I won't even mentioned the hay costs for us! So I think its time to do another interview as after our ABC interview it rained two weeks later and we received some good rain with 104mls for that month but sadly not enough. March onwards it reduced down to 69mls and April was 26mls, May 15mls, June 72mls and July only 3mls. So maybe if I do another un-glam interview I will make it rain! We finally managed to sell our mini-cattle only two weeks ago and buying hay was getting harder and also feeding the 15+ alpaca's who are all pregnant so that will expand quickly up to 25+ alpacas, which means a lot of lucern hay for my babies next season. Hope you have all seen the images of the Upper Hunter drought and how worse it is across NSW and QLD. The good team at Buy a Hay Bale have been working non-stop delivering goods to large farmers who need help. You can make a small donation to them here. Photo taken June 2018 its all very crunchy under foot. The alpaca having brekkie on lucern hay and they love it. Click here to read the February 2018 ABC Interview. We are just about to start the wood-fired pizza oven but a good game of rope quoits is now in play. It's such a classic game and something we played back in the days! Its now available to play in our AirBnB farm stay. We are now taking bookings for Spring 2018 so book now before we book-out again. Spring bookings are now only for 4 pax and a minimum two night stays. You can book online at AirBnB for your unique glamping farm stay experience at Little Valley Farm. Its such a glorious Monday at the farm. So its time to kick off my oh-so glam boots and get relaxing in that outdoor bath on the famous red rattler train deck. The alpacas have been moved to other new paddock so we can now rest the creek paddock for a couple of weeks before they return there. From the bath, I can see the boys neck wresting the day away. Boys will be boys! Check out my glam red boots by Merry People - they are made by an Australian company who produce fabulous, comfy and warm - yes, finally a pair of boots that are warm! Thank you Merry People Rainwear. We love them. Rustic farm stay glamping style: Satisfying your craving for the outdoors and your penchant for a good meal, nice glass of wine, and a comfortable bed. Its nothing like a hotel, your room does open up to a beautiful landscape instead of a lobby. Our off-grid farm has a 1950's Sydney Train carriage, the famous Red Rattler plus our petite Shepherd's Hut. A unique 'glamping' farm stay experience for 4 adults plus its the perfect place for star gazing and so much more.